Back to school for Caleb means…back to school for us, too. This morning, Eric and I spoke to the 3rd grade at Caleb’s school about fragile X and Caleb. We did this last October but we wanted to get in there early this year so, one week in, and we’re done. Caleb’s teacher and the other inclusion teachers were all very excited that we were coming in to do the talk. It’s hard to go wrong with a light saber as far as 3rd graders are concerned! Before I get into the details, I want to give proper credit here…we do this because Holly Roos convinced us that it was important and because she gave us all the tools that we needed. She has, for years, shared ideas and advice on how to do this and I’m so very glad we took on the challenge. I strongly recommend checking out Talking with Students About Fragile X Syndrome. She shares her Powerpoint slides from the presentations she’s given on the topic and there is a podcast. A couple people asked last year about what we said and I shared very generally (Dialing it down a notch) because you really do have to customize this to fit your child and your situation. I’m sharing the entire “script” I wrote out this year with commentary to perhaps spark your imagination if you’re stuck. I had NO idea what we were going to say until Monday night and this was all written last night. I am procrastinator…hear me roar. This is color coded and printed on note cards which we carried with us. Blue is Eric, Pink is me and Purple is the free for all where we both chimed in. Anything in black is either commentary or what the kids suggested/added. 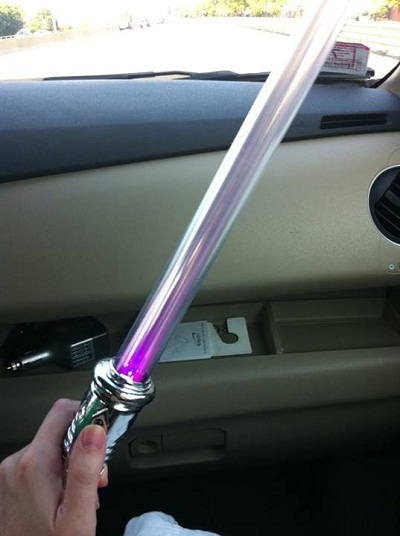 This light saber is pretty cool, do one of you want to come try it? Isn’t it cool how it lights up? Shake it hard…isn’t it cool how it changes color? (We didn’t invite anyone to come up, it was too crowded, I demonstrated it to more gasps and laughter…be flexible and just go with it!) I want you to take a minute to think, what kind of game would you play with it? What would you pretend? Don’t call out the answer, just keep it in your head and remember it, OK? This light saber, with all the lights flashing and fun noises, is like you guys. You don’t have fragile X. Your brains and your bodies all work together to turn you guys into pretty awesome, fun kids. Caleb is like the light saber too, but he DOES have fragile X so sometimes his brain and his body don’t work together exactly the same way…so he’s kinda like the light saber without batteries. But he’s still pretty awesome and he’s still fun to play with. What is fragile X, what does it mean? We get asked this a LOT by grown-ups…most people have never even heard of it. Fragile X is a genetic disorder, do you know what that means? Genetic? We are ALL made up of lots and lots of genes. They decide what color your eyes are, what color your hair is, how tall you will grow…all sorts of things. If something is genetic it means it’s passed in your genes. And we can’t pick our genes…whatever is in those genes is what we get…we can’t just decide to be taller or shorter, can we? Caleb didn’t choose to have fragile X…it’s just how he was born. It also means that you guys can’t get fragile X. You can’t catch it like a cold and you won’t ever wake up with it, OK? So we are all lots and lots of genes and fragile X is one of those genes. It’s a gene that every single one of us has. Most of you are like Eric, you have between 5 and 45 repeats of that gene…which is just perfect and that gene does what it’s supposed to do…it makes a protein that makes your bodies and your brains work just right. Then there are some people, like Caleb, who have even MORE repeats. Caleb has…does anyone want to guess? (after a few low guesses someone jumped straight to 1,000…which made me think, “Well, that escalated quickly!”) He has between 800 and 1,000 repeats. If you have more than 200 that gene stops working, so Caleb’s gene…it doesn’t make that protein that his brain and body need to work just right. He has fragile X syndrome. So let’s talk about what that means for Caleb. We did this last year too but I bet it will be a little different because you guys have grown up and changed in the last year. So has Caleb. Let’s list things you like to do at home (basketball, homework, art & music, hockey, origami, golf/sports, TV, play with friends, go to the park, go to the pool/beach…origami TWO kids said this, the teacher was just as surprised as we were.) Awesome. Let’s list things you like about school. (math, art & music, gym, recess, lunch, science, writing, reading) Wow that’s a pretty cool list…I’m seeing some new stuff on here! Now, I want to talk about this light saber ONE more time. Two of you here know where Caleb got this…where did he get it? At the circus. Last year Peter and Jesus Enrique went to the circus with Caleb for his birthday. It was the FIRST time Caleb was able to go and sit through a circus like other kids when they didn’t lower the sound or make the lights less flashy. He didn’t do it exactly the same, did he? He had to use his iPad a lot…but he did it! And he talks about going back all the time. He never could have done that without Peter and Jesus Enrique there to help him. His friends, you guys, make ALL the difference in the world. We then thanked them and started to say good-bye when one of the boys said, “Are you going to leave it that way?? With the cotton?” Ha! Yep, because it’s just the way Caleb likes it. This was just too much fun. It took about 45 minutes, with the biggest piece of that being the question and answers part. I was a little nervous before but once we got going it was pretty easy…and it was really, really fun to hear how the kids see him. They really do understand him and like him. Now it’s your turn! If you’ve ever done this, I know a lot of you have, I’d love to hear what you shared…we do need to do this again next year! ← It’s a new year. Caleb is very blessed to have such great parents! Thank you for sharing your story. It made me remember the many talks I gave about Fragile X Syndrome. Here’s to a great school year with lots of success!